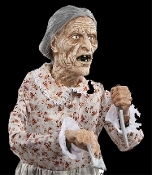 This creepy classic life-size Psycho inspired Mother is not your normal sweet Granny! This scary 5-foot-(150cm) tall deluxe static prop features an easy to assemble push-button frame, posable arms, a full length dress and realistic plastic head with full gray wig. Her plastic hands hold a room key in one and a threatening knife in the other. Could she be a formerly living proprietor of the Bates Motel? 60-inch (150cm) tall. Recommended for indoor or covered porch use only.